Every week or so one of us (usually our Director of Environmental Art or one of our art interns) heads out to Rain Yard, an interactive environmental art installation by Stacy Levy, for a regular check up. Rain Yard is designed to be education, art, and intervention. The steel sculpture, painted a rich blue-purple, collects stormwater runoff from our Visitor Center roof, slowing the movement of nearly 100,000 gallons of water a year. Some of the water flows through a rain garden, over which visitors walk, and some goes into a cistern from which it is pumped through the sculpture by visors of all ages. That’s where these regular cleaning visits come in. The sculpture allows water to pool and drain through various hoses. The little openings for the drainage hoses seem to invite children to fill them – with sticks, pebbles, and other treasures found around Rain Yard. When it’s not curious visitors, the wind is carrying leaves and grasses into these openings. The result is that we regularly have to go out and clean them, making sure that water will continue to flow through the artwork. 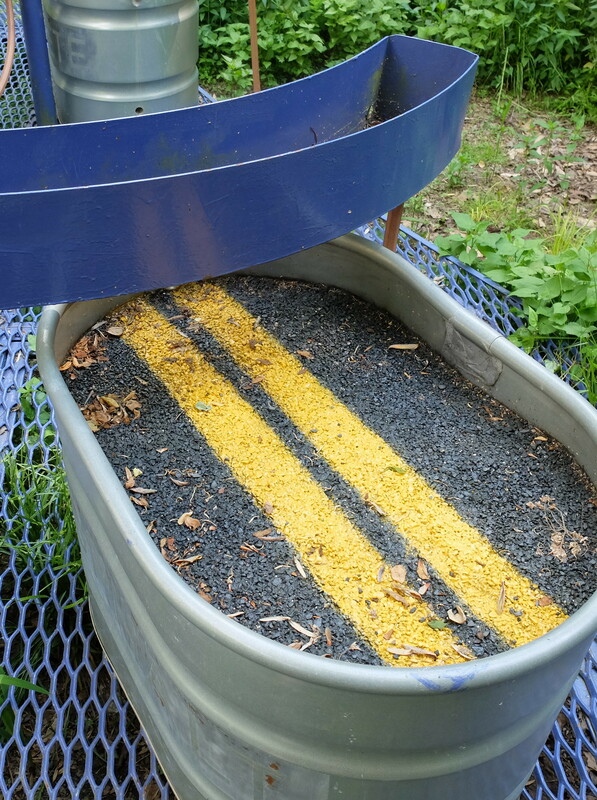 In the three and a half years since Rain Yard was installed we’ve also had to repaint the yellow strip thin the basin representing asphalt; a lesson in maintenance indeed. Stacy Levy’s Rain Yard is one of seven long-term environmental art installations on our property. Some of these works have been here more than a decade, others are just a few years old. We write often about the relationship between environmental art and time because the action of time, of the elements, of the natural world is so important for the many of the works installed here. Time is an active participant in the creation of these works. But today I want to talk about the thing that comes with time: maintenance. Every few months someone must sweep the leaves and debris off of Lentic, a beautiful and delicate Stacy Levy installation etched into stone at our Springhouse Pond. Without this regular care, the installation would nearly vanish – in fact, it was just a year ago that staff realized that the etching, when cleaned revealed itself to be bright gold. Likewise, Native Pollinator Garden, installed by 2014-2015 LandLab resident artists Maggie Mills, Ben Mills, and Marguerite Hagan, must be watered, weeded, and pruned often, to keep the tiny details of the sculptural bees visible and the plant make-up native and pollinator-oriented. For a long-term installation, the choice to maintain or not will determine what kind of artwork it will be, how visitors will experience it for years – if not decades, and what impact it may have on our forests and fields. Often overlooked, maintaining outdoor environmental artworks is as much as part of their process as envisioning and building them is. 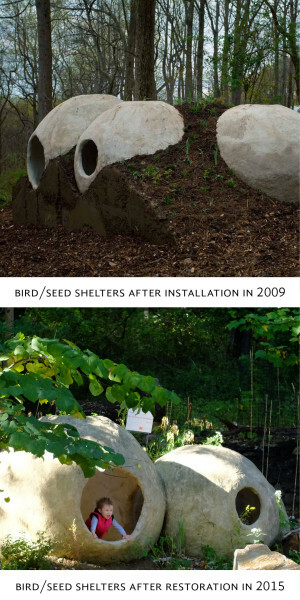 Over the years a sculpture may wholly transform – like the Bird/Seed Shelters. These cement orbs were installed as part of an international environmental art design competition in 2009 called Gimme Shelter. Six years later the sculptures had lost much of their original design. But, they still provided a unique way to view the forest and interact with the spaces. In 2015, staff replanted the area around the shelters, and installed a new set of stone steps into them. The Bird/Seed Shelters continue to offer a shelter in the forest, a space for imagining what shelter means – for an animal or a child, playing in the woods. Everyone loves an opening – the glory of unveiling a new artwork or retrospective, the chance to talk about new developments and directions in an artist’s practice. So my question is, who will love the maintenance? Who will go out to sweep leaves from etchings, pull invasive plants from the native plant gardens, pry pebbles and twigs from the drains? We can do this. And we can see it as an act of curation, and act of love. In maintaining these artworks, we keep them living for visitors and functioning in the landscape. Cleaning and weeding – or not doing so – is curating our living artworks, especially those which collaborate with time and nature. It is for love of these works that we care for them. As those artists whose installations are on-going know, maintenance is art. Hi! We invite you to join our community of conservation projects, environmental educational activities and ideas to help the environment http://www.sustainablefriends.com, so that you can participate and benefit in multiple ways. This site is amazing and the works are inspiring!